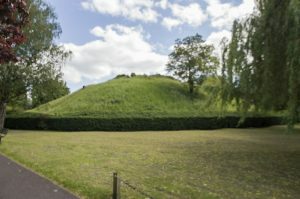 This is the motte of Cambridge Castle, the surviving part of an important castle founded in 1068 by William the Conqueror alongside the existing town, and possibly within ramparts of Roman date. 27 houses were demolished to make room for the castle, which occupies a spur near the city centre commanding the best crossing point of the River Cam. 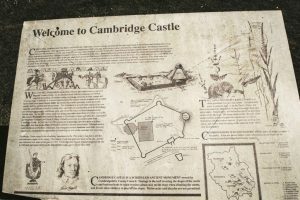 The castle served as the centre of royal administration and justice for the town and county of Cambridge, and does not seem to have had a particularly eventful history. The town was burned in 1088 by rebellious barons, but there is no mention of the castle. In the 1140s, Geoffrey de Mandeville took and sacked the town of Cambridge, and towards the end of the Anarchy, Cambridge was granted as an earldom to William de Roumare, later Earl of Lincoln in 1139/40 before he became Earl of Lincoln after 1143. We might assume that he used the castle as his local base in this time, but cannot be sure given the uncertain times! Cambridge also served as the home town for Eustace, the son and heir of King Stephen – it was from here that he set out for his attack upon Bury St Edmunds Abbey, a sacrilegious act that many contemporaries believed was the cause of his death shortly afterwards; the town was apparently part of the dowry due to his wife rather than held by Eustace himself, and probably was granted to her in 1152. Although we do not know whether the castle was their home “base”, it seems quite likely. In 1201 King John spent £4 15/2d on repairs to the castle buildings, which needed further repairs in 1205. In 1215 it was assaulted and taken by barons hostile to King John, recaptured by September 1216 when John stayed there, and retaken from his man Falcasius de Brent to host Prince Louis shortly after John’s death. During the Baron’s Revolt of the 1260s King Henry fortified the town with a ditch, but this was not enough to repel rebels from the Isle of Ely who burned the town – which was deserted. The houses which had been occupied by the king (presumably in the castle) were also destroyed – and in 1278 the castle was considered to be a nuisance to the townsfolk due to its decay. In the late 13th century, Edward I embarked upon a complete rebuild of the castle, incorporating the alteration of the bailey to a rectangular shape and the erection of a curtain wall with stone towers around the perimeter, and a rectangular gatehouse along the south-east wall. 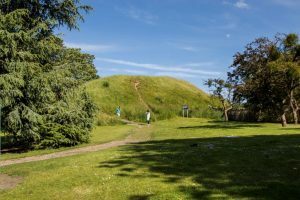 These walls extended up the side of the motte to join the sides of a tower on the summit, which measures 11 metres across. Part way down the motte is a level terrace which is believed to have supported an apron wall to help support this tower. 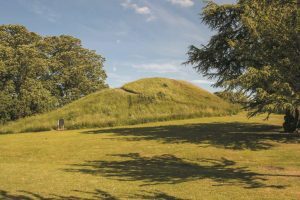 The whole castle was surrounded by a wet moat, which also separated the motte from the bailey area. Edward spent £2,525.00 on Cambridge, a considerable sum bearing in mind his commitments to castle building in Wales at the time! By 1367 the wall, towers and buildings were becoming dilapidated, and throughout the 15th and 16th centuries they were being used as a source of building materials for the expanding university college – the process started with Edward III, who was actually intending the stone to be used for the new King’s Hall in the college. Henry V gave the stones and timber of the hall to the master and fellows of King’s Hall to build a chapel, and further grants were made by Queen Mary and Queen Elizabeth. By 1574 only the gatehouse had been retained, which served as the county gaol. In 1643 the bailey was repurposed as an artillery fort, and served as the central fortress of Oliver Cromwell’s Eastern Association. Angular bastions erected at the four corners of the bailey and barracks built within; the defences were slighted in 1647, and partially destroyed, the gatehouse and barracks being retained as prison buildings. The gatehouse, the last remaining part of the medieval castle, was demolished in 1842, after the bailey area had been levelled and parts of the moat filled in. The two northern bastions from the 17th century have also survived, but in a denuded form. Part of the site today is covered by the Shire Hall (1932) but the rest is a public park area and free to access.